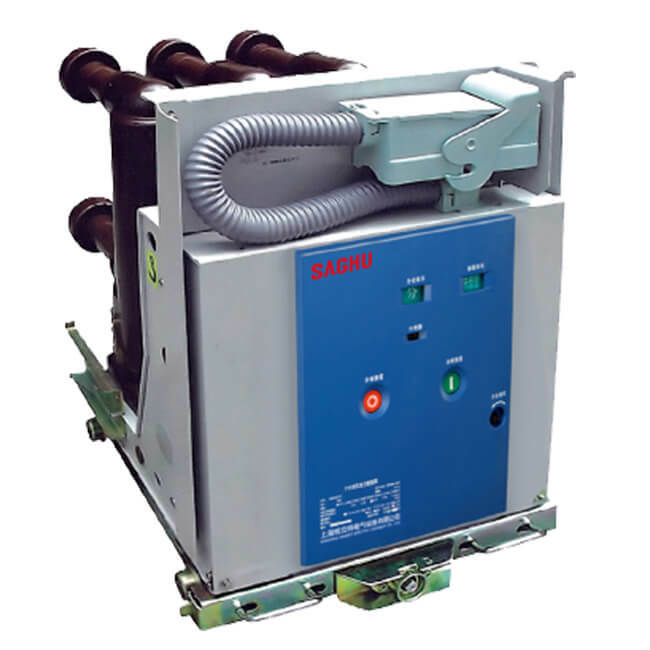 ZN63(VS1)-12 series embedded poles type indoor high voltage vacuum circuit breaker adopt solid insulation structure, use of advanced solid epoxy sealing technology, the first time, the vacuum interrupter. A leading electrical circuit.insulation and other support to become an integrated combination of solid seal pole. Successfully from a fundamental solution of the vacuum breaker gas environment, tolerance issues, make it more broad. Integrated solid-pole closure of the fluent use of a self-ventilation technology, cleverly solved the structure of solid insulation caused by heat dissipation. ZN63(VS1)-12 series embedded poles type indoor high voltage vacuum circuit breaker is the first to achieve maintenance-free concept of a circuit breaker. Its high-life vacuum interrupter chamber as well as solid cast epoxy sealing technology applications to ensure an integrated solid-pole sealed maintenance-free, with high reliability using permanent magnetic actuator of the actuator to ensure maintenance-free, electronic control parts reject the traditional auxiliary switch and replaced by photoelectric proximity switches, and use the whole power and intelligent electronic control unit ensures that electronically controlled part of the maintenance-free.